"Sometimes described as a blending of perceptions, synesthesia occurs when one of the five senses is aroused, yet two respond." "Synesthesia, the phenomenon whereby one sense is stimulated and another also responds i.e., when words have colors or tastes have shapes is not newly discovered (Rimbaud, Liszt and Nabokov were famously synesthetic), but the condition has hardly been discussed, much less systematically researched." 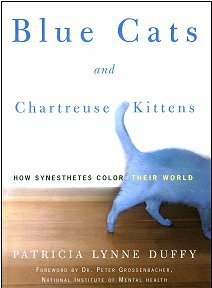 That's why I put a link to Blue Cats and Chartreuse Kittens: How Synesthetes Color Their Worlds above. Buy the book! It's weird stuff." "This book is a delight. Synesthesia is usually called a medical (specifically a neurological) condition, but Duffy's account persuades me that we should regard it...as...the gift of enriched perception...She is fortunate enough to be both a journalist and a synesthete, with the gift for communicating clearly about her other gift...Her account is not only moving and evocative, but historical and scientific." "...true synesthetes are rare. So are books about them. This one, by synesthete Patricia Duffy...provides a rich panoply of sensory experiences that we can share vicariously." "...the book is a fun and worthwhile read. Whether you're a nonsynesthete amused by colored words and shapely smells or a synesthete annoyed with the notion of a "cat" being a blue word (when it's clearly brown), either way, you'll shake your head and marvel." "...Duffy opens the [synesthesia] story wider to take in the rest of humanity, among whom, William James observed, no two people perceive the world exactly alike. Synesthesia is closely connected to creativity, having affected Vladimir Nabokov, David Hockney, Arthur Rimbaud and Richard Feynman, to name a few." "Duffy, herself a synesthete, shares with readers what it's like to have such perceptions. She also relates stories of other synesthetes, including physicist Richard Feynman and artist David Hockney." "It took technology like PET scans to confirm the unusual brain patterns of synesthesia, but some artists of the past - Lizst, Rimbaud, and Nabokov, for example - seem to have experienced it. Duffy describes her own personal experiences and that of several contemporary artists in examining the phenomenon as a special case of "personal coding" scientists now recognize as a vital aspect of brain development." "As a synesthete myself, I know this book's description of synesthesia is accurate and true. It tells the real story."